Thought this was quite bland. Needed a lot of extra seasoning and some grated cheese to give it any real flavor and depth. Honestly this was better than I expected, considering the simplicity of the recipe. I'm always hesitant to cook fish in the slow-cooker but the halibut did come out very moist and cooked through in 1.5 hours on low. A couple notes on the recipe, however: I coated the cooker with some olive oil before placing the fish in it and glad I did, because it still almost was starting to stick to the bottom. Also the recipe only calls for 2 fresh tomatoes and that they should yield 2 cups of pulp after seeding and squeezing out the excess juice? Those must be really big tomatoes. I ended up using a whole 28oz can of plum tomatoes to get 2 cups of strained pulp. This was one of those recipes that seemed like would be more work to make via slow cooker than stove top...so I just made it stove top. That way I didn't need to saute the onion & garlic (to which I also added some celery) in a separate pan and it was all done in about 90 minutes (since I cooked down the tomatoes and broth in an hour instead of three.) Pleasant enough results but not really a standout fish stew. Not bad. Chicken came out very tender and juicy, but not a lot of distinct orange flavor, I have to say. Be sure to season well. Pleasant and easy, nice dish for a lazy Sunday. I used baby potatoes and they were perfectly cooked doing the 5 hours on low setting. What a disappointment. You would think that with the olives and capers, this would be very flavorful, but the chickens were just bland to me. The olives and capers were added at the last 15-30 minutes of cooking, probably not enough time for the flavor to blend. My husband liked the dish though. So far this book has been a dud for me. p. 141 - I used a top sirloin roast since there was a great sale so with the slow braise and wine-infused broth, our Barolo Beef was fork tender! This dish comes together in no time then just simmers away all day, making the house smell so enticing I might add. We especially loved the tomatoes in sauce for this dish. The first night we served the roast sliced over garlic mashed potatoes and the second time around we made Chicago-inspired Italian beef sandwiches. We though this was outstanding and will definitely make this again. This starts out in a skillet, where the beef is browned, as is the pancetta. The instructions state to brown them together, but the beef needed to be done in batches, and I thought it would be too hard to scrape out all the pancetta if it started getting overdone. So the beef was browned first, then the pancetta, then anchovies and garlic were added. The pan is deglazed with white wine, and it all goes into the slow cooker with a sprig of rosemary, and cooks on low for six hours. The entire house smelled lovely, as did the final product. One little sprig of fresh rosemary certainly does not overwhelm two to three pounds of beef. And the flavor was nice. I made polenta using a very dark demi-glace, and the sauce from the meat was quite good over that. The meat was tender, but rather dry. Cooking time too long? Perhaps. So, next time I guess I'll try a shorter cooking period. But it kind of defeats the purpose if you have to stand over it and check it periodically, no? I had an extra 3/4 lb of meat. Cooked at low for 7.5 hour and the meat was not quite tender yet. I cooked it at high for another 4 hours the next day to get it to fall off the bone. Pleasant if nothing particularly exciting. I found 4 hours on low was not enough time to really end up with tender veal stew meat; I upped it to high for an hour and then it was fine. I would make sure to use a nice rich stock and perhaps add some white wine next time if I make this again. Came out "okay" but I'm not sure I'd make again. That is, I don't think cooking it in the slow cooker really did anything to the flavor and it would have been better off completely braised. As it was, I had to finish it in the oven to reduce down the sauce and give the meat the kind of browning I wanted. Excellent - so far my favorite recipe from this cookbook. Nice complex flavor for a pork stew, I will definitely make this one again. This stew was fine but nothing mind-blowing. I used a beef shoulder roast rather than lamb because that was what I had on hand. The sun- dried tomatoes cook down and add lots of umami to the dish, but if I hadn't made this, I wouldn't have known they were in there (that may be the point). The rosemary wasn't discernible either. Finally, you really don't need a slow cooker for this recipe- you still have to brown everything before adding it to the stew and it only cooks 6 hours in total. A very easy to throw together side dish that I was impressed by. Mixing the squash in with the potatoes lightens it up and I found it was all cooked through and tender, but not mushy, in about 2 hours and 45 minutes. With the Italian Slow Cooker, every cook who can spare 10 minutes of prep time can leave the house for work (or retire for the night) and return to a meal that tastes as though it had been coddled all day by and Italian grandmother. Michele Scicolone, a respected authority on Italian cooking, shows how fresh ingredients and a few simple steps can lift dishes well beyond the usual "crockpot cooking," while keeping all the plug-it-in-and-walk-away convenience. 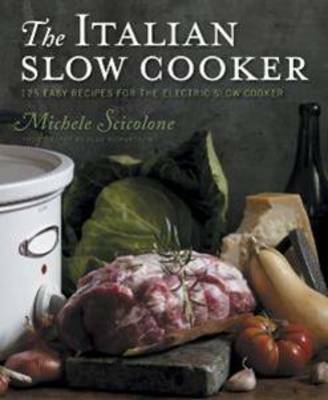 In addition to providing scores of Italian classics that beg for a slow cooker (Turkey Meatball and Escarole Soup; Meat and Mushroom Ragu), Scicolone shows how a slow cooker can make "stir-crazy" dishes like polenta and risotto without any stirring at all. 125 authentically Italian recipes and full-color photos throughout.